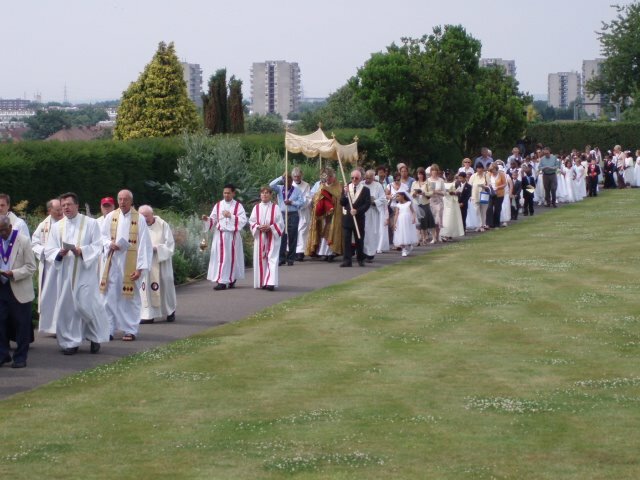 Despite England playing Ecuador in the World Cup, there was a commendable turnout for the Blessed Sacrament Procession for Bexley and Greenwich deaneries. Fr Michael Scanlon, parish priest of St Peter's, Woolwich, and new Dean of Greenwich has the honour of carrying the Blessed Sacrament. My job of being MC now seems to be taking on a permanent air. That suits me as I enjoy trying to make the ceremonies as dignified as possible. The procession is impressive as we wind our way around the gardens next to the Abbey ruins, meditating on the mysteries of the Rosary, and singing various popular chants. 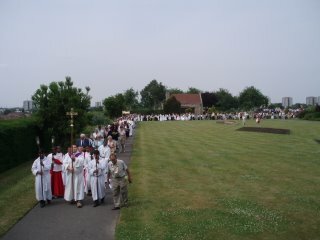 The participants are of all ages - lots of babies, first communion children, teenagers, and older parishioners. Each parish has at least one banner. Fr Michael Branch, the new parish priest of St Patrick's Plumstead is the preacher and his sermon reminds everyone of the importance of the doctrine of the real presence as well as the missionary dimension of today's procession. We had a full coach from Blackfen as well as many people going in their own cars. I felt a bit sorry for the young coach driver who had to miss the first half of the football. England: dramatic draw - Yeeeeess! Opus Dei and "Pink News"
Why keep to the default browser? Warning - "Medical Aid for Palestinians"